I don't know if this is a common issue, but it's come up enough in recent months that it seems worth posting about. If you have personal experience in this area, I'd welcome comments and feedback, here or on the facebook page Walking Through Fog. You may have guessed by this point, but the "issue" I'm referring to is getting a tattoo while dealing with chronic pain. If you are a "spoonie" and have considered getting a tattoo, it's possible you've faced the same self-doubts and/or others asking some version of the question, "Why would you put yourself through that kind of pain voluntarily when you are already dealing with pain you can't control on a regular basis?" I know after I started physically recovering from my miscarriage last November, these are thoughts that dominated my perspective. How much would it hurt? Would it make my pain from Fibromyalgia worse? Would it make it harder to get my doctor to take my pain seriously? Would it create confusion and contention with friends or family who already seem skeptical about my "condition"? I can tell you from personal experience that these and many other questions rattled around my mind as I thought constantly about whether or not to get some kind of memorial tattoo for the child we'd lost. Yet, in spite of all my fears and concerns about the ramifications of this decision, I still kept coming back to the intense desire to mark the life-altering event with a visible "battle scar" to show the tremendous struggle I'd come through. Eventually, through discussions with my husband and some close friends, I came to the conclusion that the risks were worth it. So, on August 5, 2016, I entered a local tattoo parlor (that I'd previously scouted out) and sat for an hour while a friendly professional tattoo artist applied his considerable skill to creating exactly the design I'd brought in. The pain levels (which I'd tirelessly Googled and compared previously) were surprisingly minimal, and with some moderately distracting conversation, I was surprised when he announced the tattoo was complete. Having heard stories of people being in such pain that they passed out, or had to break up their ink into separate sessions, I was ready to stretch my limits just to get through. It turned out to be relatively easy compared with my daily experience of chronic pain and fatigue. Coming out of this experience has left me with a few questions. Why was it so important for me to get this tattoo? 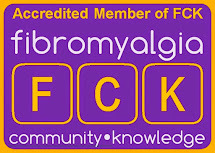 Why was it such a "non-event" on the pain scale when compared with Fibromyalgia symptoms? I've come to a few observations that I think help explain these reactions. 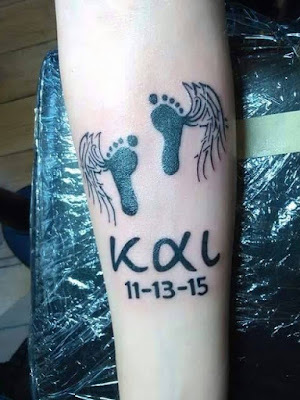 My tattoo in memory of our miscarried child "Kai"
One thing that this experience has shown me is that there is something inherently powerful about having long-held invisible pain made visible to those around you. As someone who struggles with pain that is largely invisible to the rest of the world, it is refreshingly therapeutic to express visibly how your pain has shaped and mingled with your identity. For those who aren't facing chronic pain, the best comparison I can reach is the mainstream experience of getting a "memorial tattoo" which is generally to remember a loved one who has passed. The loss of a close friend or family member becomes part of your journey and shapes how you move forward for the rest of your life. 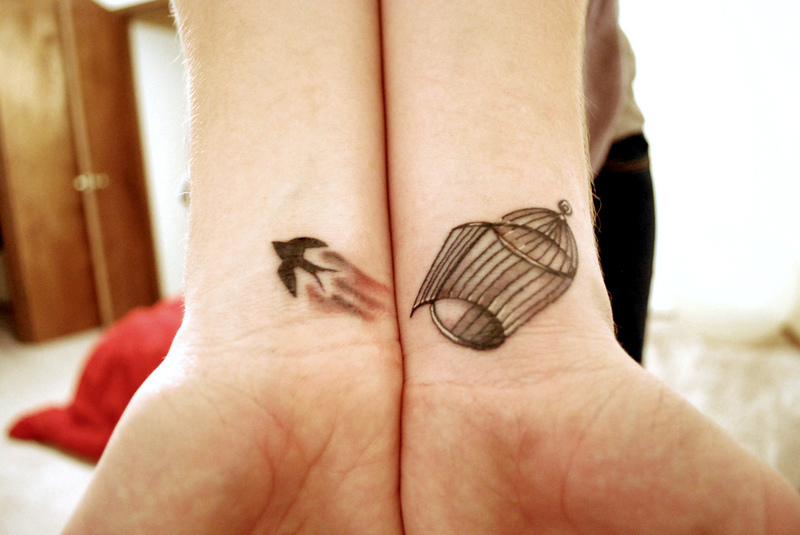 This was the case for my tattoo. 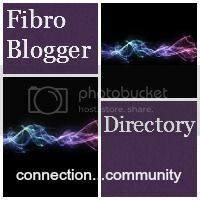 God did a lot of work in me through this process, and sadly in our culture miscarriage has largely become as invisible a grief as the chronic pain of Fibromyalgia or Rheumatoid Arthritis. In giving expression to the tragedy of losing an unborn child, I found strength to incorporate that experience into the rest of my life. In addition to giving voice to the invisible struggle, I believe that there is a possible explanation for the pain of a tattoo not even comparing with the chronic pain of autoimmune diseases. While our culture stereotypes chronically ill people as weak and sickly (not able to cope with even normal stimulii), it simultaneously portrays getting a tattoo as an incredibly tough, painful experience. Reality has taught me this could be backwards. Living everyday with pain that will not subside is a tough, painful experience. On the other hand, getting a tattoo in a relatively common area (excluding the obviously very painful ones) like an arm or a leg is not necessarily that painful. It can be, depending on your personal pain tolerance and the artist's skill level, but it is not the torturous process that mainstream America has decided to portray it in pop culture. So, why am I bothering to overthink all this? I think this can be significant for a few reasons. First, it reminds me that facing chronic pain does not make me a weak person. 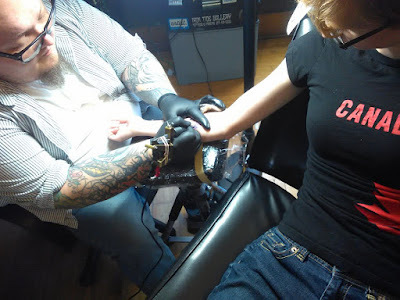 Getting a tattoo was a very empowering experience, and it left me feeling that at least this time, fibro didn't win. Being sick does not mean I have to stop living my life. Second, it forces me to face culture's expectations for me as someone who struggles with chronic health issues. I do not use a wheel chair or oxygen. I don't have a noticeable limp. If you just saw me on the street, I would look fine. By doing this, I get to define what my condition looks like. I get to look good without feeling guilty, or feeling like a poser. I am sick, and I don't look "sick." I know, it's crazy, right? Third, it gives me a greater compassion for people who make decisions I don't understand. There are millions of people around the world who are dealing with situations and decisions I haven't had to face. Just as not everyone will approve of getting a tattoo, I won't be able to relate to other people's decisions. That's okay. I am willing to give them space to grieve and process in their own way. I don't have to make the same decision to be able to appreciate the person making it. While some people may shake their heads at seeing my tattoo, without knowing the story, and assume I'm just one of those millennials who hopped on the ink bandwagon, I know the significance of my decision. I am perfectly content to live the rest of my life with this particular battle scar visible on my arm. Any other spoonies out there with tattoo stories and experiences you'd care to share? I'd love to hear your stories.